So about a year ago I picked up a copy of Ghooost Card Game. Manufactured by IELLO and designed by Richard Garfield, this is a fast paced game that delivers fun. The family style card game features a variety of Halloween style characters that aren’t too scary for the kids. The goal of the game is to get rid of all your cards. Each player has to lay a card that us equal to or higher than the one the player before them played–special note: if you have multiple matching cards then you can play all of them as if they were one card. This discard pile is called the Cemetery. If you can’t play a card, you get to pick up the whole pile of cards in the Cemetery. Your goal is to get rid of all your cards. During the first have of the game, there are a pile of cards that haven’t been used. After your turn, you must pick up enough cards to get your hand back up to 4 cards. Once all the cards from the draw pile have been played (the draw pile is referred to as the Crypt) then the second half of the game begins. After this point, the first player to play all their cards, wins. During play, there are a few cards which have “special” actions or powers. If a player plays any red card, the next person must also play a red card equal to or higher than the played red card on the Cemetery pile. At any time, you can play multiples of the same card as if it were just one card. If you lay down two or three matching cards, it immediately becomes your turn again. This is a good way to get rid of cards. If you happen to play all four matching cards of a particular number, it is referred to as a quartet. When you do this, those four cards and all the other cards in the Cemetery are immediately removed from play forever. If you empty your hand, you win. After a player wins, the remaining players continue playing until everyone has won except the last player. Pros: The game is easy to learn, easy to play and quite fast paced. The game plays fairly well in about 15 minutes after you know how to play. Kids and adults both will enjoy the characters on the cards. You can play just one hand or multiple hands–your choice. Even my six-year-old can play–the box says 8+ but younger kids will catch on quick. Cons: I don’t like the rule that play continues until one “loser” is left and everyone else is declared a winner. This seems a bit harsh to me for a kids game. Easy enough to fix–just play until one person wins that hand and then stop right there. Overall Rating: I give this game an 80/100. The game is loads of fun but can become a bit routine. Great card game for occasional use. Definitely will stay on our shelves. Really good for parties–up to six people can play and it doesn’t take a long time. Best Game Ever! If you are looking for a game that you can play with your kids, Ticket to Ride is what you need. If you worry that it will be boring for adults, have no fear. This is one of the most enjoyable games on the market for all ages. Not only is it simple to learn, it also creates the perfect amount of challenge, intrigue, competition and fun every time I play it. So a quick review of how the game is played. Each player, and there can be from 2-5 players, picks a color. They then are dealt four Train cards. These cards will be used throughout the game to create train tracks across the map. (As an aside, the game board is a basic outline of the US with most major cities shown as destinations). Each player is also dealt three Destination Ticket cards. Each of these cards show a pair of cities between which the player will attempt to build a train track of their color. For instance, if I am the blue player, and I drew a Destination Ticket card that showed Montreal to Toronto, then I would attempt to place three of my trains on the three spaces shown on the board between Montreal to Toronto. Here is the fun part–after you draw your three Destination Cards, you can choose which ones to keep. Once you have decided to keep a Destination card, you must keep it through the whole game. If you build a track between the appropriate two cities, you score the number of points shown on the card. If you fail to build the track, you lose that many points. Each player is competing for spots on the board. I may be trying to build a track from New York to Los Angeles and everyone else may be in need of the same track positions. In which case, if they “block” me out by taking all the available routes, then I am going to lose points instead of gain them. At the beginning of each turn, a player can choose to draw Train Cards, Claim a Route, or draw Destination Ticket Cards. A player may only do one of these three actions. If they choose to draw Train cards, they can either pull from the four showing cards or from the deck (which will give them an unknown card). If they choose to Claim a Route instead they must have enough Train cards of a specific color to play. To do this, they play their Train cards and place a corresponding number of train pieces on the board. To play, you must be able to build out an entire segment. For instance, if the segment is six green spaces long, I must have six green Train Cards to play (or I can mix in a few wild cards to meet my requirement). Or for their turn, a player can draw more Destination Ticket cards. If they choose to do so, they draw three and must keep at least one of them. This can be risky, but provides a player extra chances to score. Scoring comes from several things. Points are scored for placing trains on the board. A longer section earns more points. Points are also earned or lost at the end of the game for finishing a Destination Ticket Card. If you finish one of these, you keep it secret from the other players until the end of the game. Ten points are also scored at the end of the game by the player that has the longest continuous train path on the board. The rules of this game are simple, the strategy is fun. This is a great game for family and friends of nearly all ages. My seven-year old daughter plays with no help–and frequently wins. 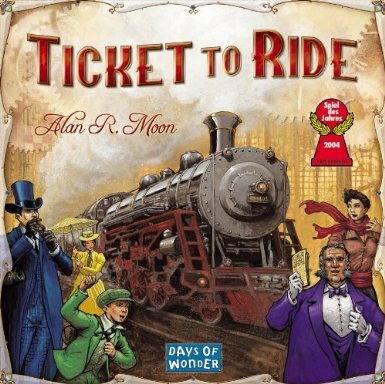 If I could only have one game in the game closet, I think it would be Ticket to Ride. A couple of weeks ago, my family and I traveled down to Panguitch, UT for a few days of relaxation and fun. We spent time fishing in Panguitch Lake, hiking in Bryce Canyon and walking around town. If you haven’t been, Panguitch is an amazing little town in the south central portion of Utah. With access to Bryce Canyon, Brian Head resort, fishing, hiking, and camping this little town has it all. One of my favorite things that happens in Panguitch is the balloon festival. If you have never been–you should definitely give it a visit. But I digress from the family vacation. 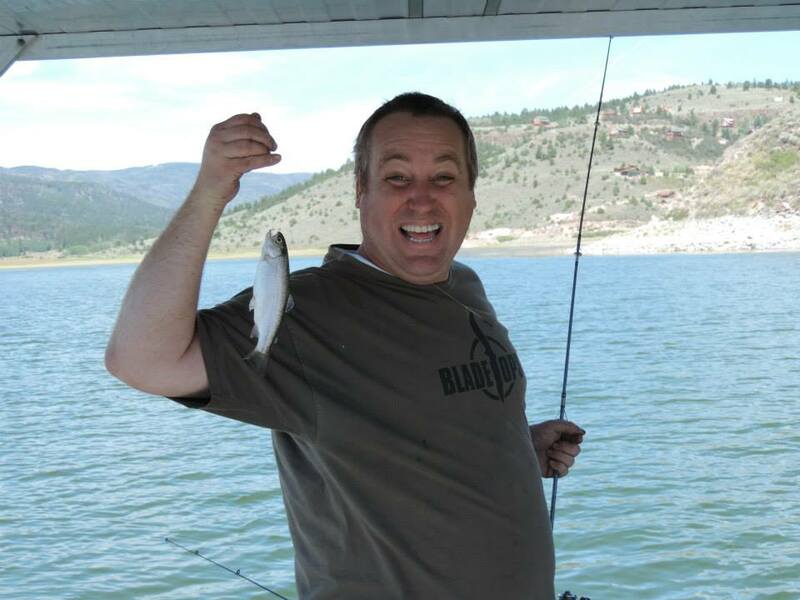 The reason I have such a cheesy smile on my face is that by the time I had caught my first fish (which turned out to be nearly a minnow compared to the other fish being caught) each of my six children had already caught a fish–and all of them were well over 20″. 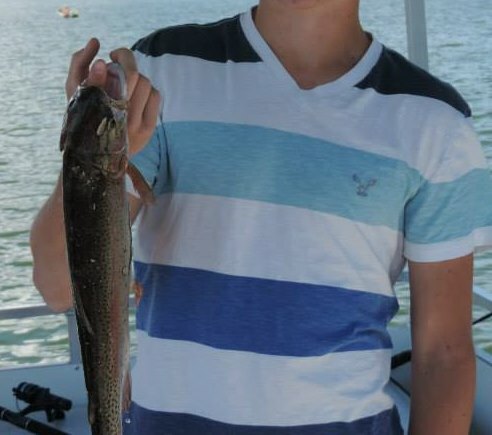 So when I finally caught my 10 incher, I thought I would ham it up for the camera. In the evenings, as we put the younger children in bed, four of my children and I played Defenders of The Realm . This strategic board game can be played by up to 4 players and is considered a cooperative style game. This means that everyone either wins or loses together. At the end of the game, if the players all win, the player who performed the best gets to be the King’s Champion. I had never played a cooperative game before and was quite impressed. Before we started, I had my oldest read the rule book. I also read the rule book. Between the two of us, we had a fairly firm grasp on how the game was played. The game took about two turns before everyone caught on to how it was played. The youngest playing was only six and she caught on completely and had a blast playing. She and I played on a “team” in case she needed some help with her turns. At the beginning of the game, each player chooses to be one of the different King’s Heroes. Each hero has different abilities and skills. It makes a lot of sense for the players to talk about who they are choosing so a good blend of skills and powers end up in the game. If not, you can have a really tough time beating one or two of the enemy Generals. During each turn, a player has the choice of engaging the enemy minions in battle, working on completing an individual quest that helps them gain extra advantages, or combating the enemy Generals. At the end of each players turn, a card or two are drawn that cause the enemy Generals to advance toward the center of the board. These cards also direct players to place more enemy minions on the board. If any of the enemy Generals reach the center (Monarch City) the game is over and all the players lose. Players can also lose the game if too many minions end up on the board, too many minions end up in Monarch City, or if all the tainted crystals (there are 12) end up on the board. Crystals end up on the board when too many minions are in one space. So each turn a player is faced with the decision of using their turn to improve their abilities or fighting against the enemy. You can fight against the minions, clean up (remove) tainted crystals, or fight against enemy Generals. If you plan properly, all the players can join in an attack on the enemy Generals–and let me tell you, to win against any one of the four Generals, you will need at least two and maybe three or four of you in on the attack. The first game we played took about two hours. Part of that is because we were playing slow and having lots of conversation. We won that game. The next night, we played again. This game went a bit faster and interestingly enough, everyone was a bit more interested in winning the crown of King’s Champion at the end of the game. Because we were all focused on finishing our individual quests (completion of which give you a huge advantage in deciding who wins the title of King’s Champion) we didn’t focus enough on the enemy Generals. We quickly “got behind” in the game and went on to lose. Both games were a ton of fun. In fact, the morning after the first game, my wife kept mentioning how funny it was to keep hearing all of us cheering or booing in unison when a turn went well or poorly. We all really enjoyed the game. I felt the best lesson learned was that we all need to work together to win. If you like fantasy and you enjoy board games I heartily recommend playing Defenders of the Realm. You can pick it up over on Amazon for under $60. I have since learned that there are several expansion packs for the game. I’m considering picking up one or two of them–we’ll see.